As the younger generation start their working careers, could it be their influence that is changing work wear as we once knew it? It seems as though this age group is more protective over identity and style of dress and are opposed to being told what to wear. What style is business casual attire? It’s a style that’s smart but not too formal. This might be a men’s shirt without a tie, navy trousers and loafers. For women it could be a smart blouse with cropped, tailored trousers and flat shoes. In one research project, more than one in ten people aged 18-24 said that they had considered quitting their job due to a strict dress code. Older employees, however, do not share the same strong views. Only 7% of those aged 55 and over said that they would think about leaving their employment because of the dress code. Compare this to 17% of 18-24s and it’s clear to see a divide. It might depend on which sector you operate in as to how your staff feel about uniform. Those working in the energy sector (32%), science and pharma sector (31%) and IT sector (29%) are most likely to leave their role due to dress code requirements, one study discovered. Is it essential that company bosses scrap dress codes for the sake of their staff? Quite possibly. Employers are aware of how high staff turnover can have great cost and productivity implications. Costs incur during the recruitment process as the position is advertised and time is spent by employers interviewing and selecting candidates. Having a dress code may deter candidates too — 61% of people looking for a new job in 2017 said that they’d have a negative perception of any company that enforced a dress code. Productivity also takes a hit, as often a current employee has to spend time training the new starter or letting them shadow their day-to-day activities — this can prevent existing workers from working to their maximum capacity. 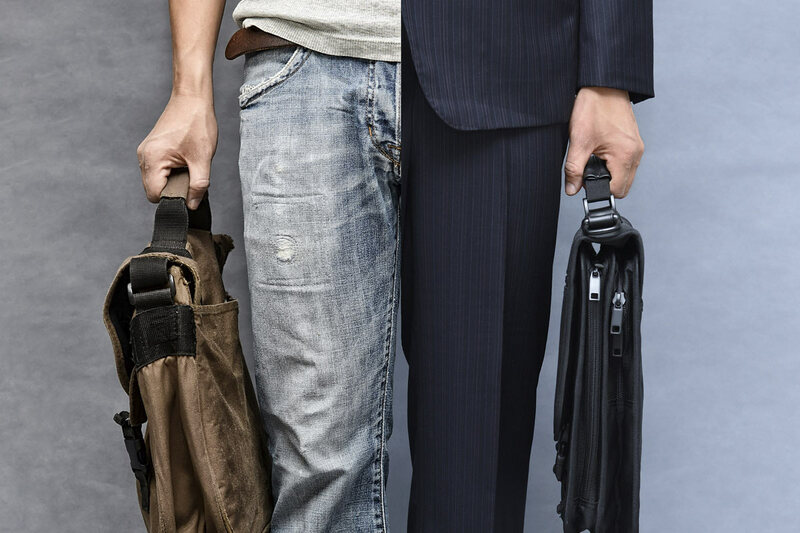 An increase in creative companies has also contributed to the business casual switch. In fact, between 2010 and 2016, the creative industries sub sectors (i.e advertising, film and TV) grew their economic contribution by 44.8%. Dress code is often less strict in these companies, as employees are encouraged to express their ‘creative flair’. Research has found that the clothes you wear can have an impact on how you act. During one social study, subjects were presented with a white coat and told different things. The participants that were told it was a doctor’s coat, felt more confident in accomplishing tasks compared to those that were told they were wearing a painter’s coat. Other research shows that wearing more formal clothing can make people think more broadly. Naturally, not everyone feels the same. Facebook CEO, Mark Zuckerberg, wears the same casual clothes every day and runs a company worth billions of dollars. He says that dressing in this way gives him one less decision to make and allows him to focus on more important workplace decisions. And, have you considered productivity? The majority of UK workers said that they would feel more productive and put more effort into their appearance if there wasn’t a strict dress code — this is according to a study by Stormline. Moreover, 78% of respondents to one survey said that they would still make an effort to dress well and wouldn’t blur the line between ‘work clothes’ and ‘non-work clothes’ if there weren’t any rules on what to wear. What’s the best advice for businesses? Taking into account the research we’ve seen, it’s clear to see that it depends on the employee as to whether they should follow dress code. Of course, it could depend on an individual’s role. First impressions still, and most likely will, always count. If employees are in a client-facing role, it’s important to look professional and approachable — they are effectively representing the business and should be making it look good. All companies should take the chance to ask their employees how they feel about uniforms and when they feel most productive. This could be the best indicator of whether a uniform is best for the business or not. As we’ve seen, uniforms can affect behaviour at work and it is down to the individuals as to whether they work best following, or not adhering to, a dress code.